For the first time ever, the National Biodiversity Data Centre will be running an exciting Island BioBlitz; five of Ireland’s special off-shore islands competing in a race against time to see which island can record the most species over a 24 hour period on 11th – 12th June, 2016. Island BioBlitz will see Cape Clear (Oileán Chléire), Bere Island (Oiléan Béarra), Inis Mór, Clare Island (Oileán Chliara) and Tory Island (Oileán Thoraí) competing against each other to see which island can record the most species and be crowned BioBlitz 2016 Champions. Each island has assembled teams of recorders, national experts, specialists & other interested individuals, to join forces to identify and record the rich biological diversity of the islands. But this is not all about experts! Running alongside Island BioBiltz is a Island Wildlife Festival with a programme of events for everyone to join in, learn more about wildlife and just experience the special charm and qualities of our off-shore islands. Make sure to put the date in your diary and join us for Island BioBlitz – it is the first time ever such a unique celebration of island wildlife has been organised. 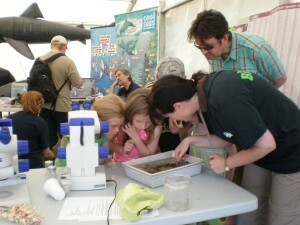 On each island a ‘Base Camp’ will serve as the hub for information and all of the Island BioBlitz activities. Base Camp is where people register, confirm species identification and log all their records over the 24 hours period. It will be equipped with species lists, recording forms and other equipment that might be needed to confirm identification and to validate sightings. Base Camp will be the central organisational point from where the teams of recorders will be managed and surveying coordinated. It is also where the survey results will be logged and from where the running tallies will be provided. The results of the surveys will be logged onto a special BioBlitz on-line application, developed and managed by the National Biodiversity Data Centre. As sightings are entered, progress on each of the islands can be tracked in real time, here on the Island BioBlitz website. This web-application will only be activated a few days before the event begins. Formal tallies from all sites will be provided at 10:00hrs on Wednesday, Thursday, Friday & Saturday, then on Saturday at 16:00hrs, 20:00hrs and10:00hrs on Sunday (12th). The recording and data logging will cease exactly at 12:00hrs (Sunday 12th June). The results of the competition will be announced at 12:30hrs. How will it be organised? Each island assembles a team of skilled recorders to record the biodiversity of the island. All of the recorders are working on a voluntary basis, giving freely of their time and expertise to make this such a special event. The recorders will use their knowledge and expertise to conduct survey work at different locations throughout the island to optimise the number of species recorded. Members of the public are invited to visit the Base Camp throughout the event to follow progress and to join in the special programme of events. This is a huge participatory event, and everyone is encouraged to interact with the recorders to see how they undertake their survey work and collate their findings. It is almost certain that the winning island will record in excess of 1,000 species, so there is a lot of wildlife to engage with! Running in conjunction with the Island BioBlitz is a week long programme of events and activities as part of an Island Wildlife Festival. This festival has an extensive programme of events on all five of the island, themed around the island natural and cultural heritage. This will appeal to anyone who has an interest in getting to know a bit more about Ireland’s unique islands. A complete species list for each island will be finalised, seeking the advice of experts where necessary, and the records will be mapped on Biodiversity Maps, the National Biodiversity Data Centre’s mapping system. A copy of this final validated species list will be available for each of the islands for their own use. Island BioBlitz is organised by the National Biodiversity Data Centre, a national organisation that collates, manages and analyses and disseminates data on Ireland’s biodiversity. Biodiversity data are a key requirement for understanding our natural surroundings, for tracking change in our environment and for gaining a greater insight to how we benefit from, and impact upon, the ecosystem goods and services provided by biological diversity; a national asset which contributes at least €2.6 billion to the Irish economy each year.